Madison Wisconsin is known for its culinary talent and dynamic restaurant culture. Downtown Madison is home to many of the city’s best known and most recognized restaurants like L’etoile, Heritage Tavern, and Harvest. With more than 100 restaurants, cafes and bars there is always something new to try. We invite you to come spend an evening out at one of the district's many restaurants, bars or clubs. 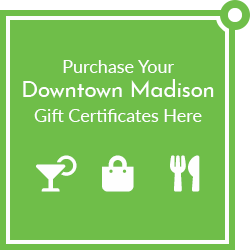 Downtown Madison Gift Certificates are accepted at more than 150 locations. Located upstairs. Full menu and lunch, dinner and drink specials daily. Student hangout in a sparse setting for familiar Asian dishes, plus daily lunch & dinner specials. Featuring coffee, tea, gourmet grilled cheese sandwiches, beer and wine, and coffee liqueur drinks, and occasional live music. Chinese and Asian food for lunch, dinner and late night. Delivery available. Martinis, microbrews and an extensive wine list. Light menu served until 11:00 pm. Featuring fifty taps of craft beer and cider, live music, pinball, and a selection of bottles and cans to-go along with crowlers and growlers poured from our taps! 111 Martin Luther King Jr.
Southwest inspired Mexican dishes specializing in tacos! Wine and champagne by the glass and bottle, cocktails, martinis, assorted bottled beers and taps. Boar & Barrel is a wine, whiskey and tapas bar with a pork-centric menu. Espresso, coffee, scones from scratch, and crepes made from local ingredients. Full service BBQ restaurant with meats smoked in-house, and three bars. Southern and Korean style BBQ. Family-friendly northwoods-themed restaurant and bar. Lunch, dinner, late night. Celebrate the spirit and flat out fun of summers past seven floors atop Langdon Street. Camp Trippalindee is inspired by 1980s camp movies, rural Wisco taverns and the all out joy of being a kid. Fun and easy eats like walking tacos, double stacked burgers and crafty beers (delivered in Koozies!) will delight. Serving up tacos and other Mexican dishes made with inventive ingredients and high-quality tortillas. Featuring a full bar, dinner nighly, weekday lunches, and weekend brunches. Breakfast and lunch, take out and delivery. Catering available. A traditional steak house with contemporary flair, specializing in steaks and seafood, with an extensive wine list. Bagels, breakfast & lunch, coffee and coffee drinks. A sandwich and made-to-order salad shop with fresh, locally-sourced ingredients. 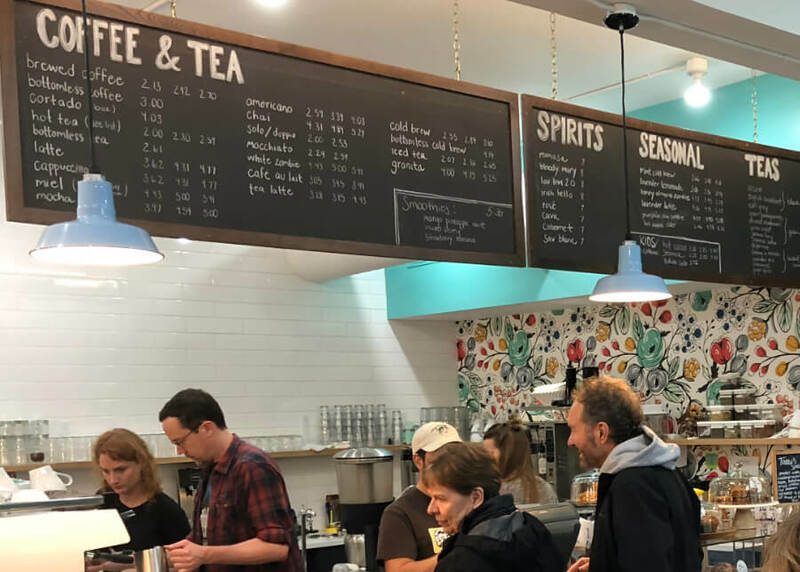 Carte also offers a large selections of freshly crafted grab-and-go items for students and staff looking to grab a healthy bite between classes. Our take on an Italian-American deli featuring sandwiches, soups, salads, deli-items, coffee, take-home dinners, retail wine, and full bar. Enjoy it at the deli or grab it to go, our food is served to order and prepared by us in house. Whiskey lounge focusing on higher end bourbon, scotch, irish, and japanese whiskey with more than 300 whiskeys available and a tap list of 27 rotating beers. Old World Italian traditions meet modern techniques. Handmade pastas, slow-roasted meats, wood-burning pizza oven, extensive wine list. Authentic chinese noodles and dumplings. Burritos, tacos and salads made-to-order. The Church Key, now a Madison institution for well-over 50 years, is a place where everyone can come to enjoy themselves. Located in The Madison Concourse Hotel and Governor’s Club, CIRC serves contemporary American cuisine with global influences for breakfast, lunch, and dinner. Upscale food and spirits, located downstairs. Happy hour specials. Coffee, tea, smoothies, custom craft beers, all-day breakfast and sandwiches. A neighborhood-style tavern serving craft beer and rustic food in a relaxed atmosphere. Lunch, dinner, late night, weekend brunch. American and Peruvian cuisine for lunch and dinner, plus Friday fish fry. Irish Pub style bar serving beer & spirits as well as burgers, sandwiches, salads, and comfort food. Longtime local institution offering specialty burgers, cheese curds & tap beers in quirky digs. Grilling burgers since 1974. Sports Bar and Eatery just 2 blocks from the Kohl Center. Featuring great appetizers, salads and pizza with over 30 beers on tap! Wide variety of Asian cuisine including Chinese, Korean and Thai; vegetarian dishes available. Lunch, dinner, delivery available. Elegant dining with a unique artisan menu, large wine selection, and full bar. Coffee, coffee drinks, tea and cafe snacks; free Wi-Fi. Close to the UW Campus. Coffee, coffee drinks, tea and cafe snacks; free Wi-Fi. Close to the Capitol Square. Quick bite comfort food featuring small plates. Dishes perfect for sharing, flavorful cheeses and charcuterie, incredible Spanish wines, and rich mahogany woodwork. Cafe, Paella, wine, charcuterie, sangria and tapas. Burgers and fries made with fresh ingredients and no trans fats. Online ordering for pick-up available. A locally sourced grab-n-go, seasonal market that brings crave-worthy fresh produce, hearty grains, and hot proteins. A modern interpretation on authentic Mexican food on Main Street. Open for lunch and dinner. Delivery available. Gastropub serving modern German dishes in a contemporary space with old-world touches. A modern dining space using local ingredients, located on the rooftop of the Madison Museum of Contemporary Art. Serving Japanese poke bowls and seafood. Health centered acai, fruit, and grain bowls. Also serving toast, smoothies, and other healthy treats. Cocktails, bottled and tap beers. Outdoor patio seating with a Capitol view. Offering a wide variety of choices from all over the globe including curries, Himalayan, sandwiches, dumplings, tacos, and more! Hand-rolled New York-style bagels, lox, pastrami, sandwiches, fair trade coffee. Breakfast, lunch, delivery. A small plate restaurant inspired by ingredients found all over the Midwest. Inspired by the New York gastropub scene. Open for morning bakery, lunch, weekend brunch, dinner, plus off-hours menu. A changing roster of house made craft brews & pub eats served in a lively venue with beer garden & pool tables. Recently named a top Farm-to-Table restaurant by Gourmet Magazine, features seasonal locally-grown and organic ingredients. Casual bar and grill. Lunch, dinner, late night. Warm in the winter… Cool all the time. Globally inspired cuisine using local Wisconsin ingredients. Dinner, happy hour, weekend brunch. Cuisine from Nepal, Tibet and India. Vegan, vegetarian and non-vegetarian. Made from scratch comfort food from everywhere for everyone. Dumplings, soup, chili, rice bowls, and juice. Pizza & fresh salad. Voted Wisconsin's best pizza by Food Network Magazine. Lunch, dinner and late-night; pick-up and delivery. Spanish-inspired tapas, cocktails and wide selection of wines by the glass or bottle. Fresh, fast, and tasty gourmet sub sandwiches. Premier midwestern steaks, fresh fish and seafood, appetizers, elegant desserts. Simple karaoke joint near campus with sake drinks. Koi Sushi Restaurant offers delicious tasting Japanese food and authentic Hunan style Chinese cuisine with a variety in taste and high quality fresh sushi. Sports-themed college bar, serving food and drinks. Breakfast, lunch, dinner, late night. Teas and slushes including bubble tea and milk tea. Fine dining supporting Wisconsin farmers by using local, organic and naturally-raised ingredients. Located in the Evjue Rooftop Garden of the Monona Terrace Community & Convention Center. Open seasonally from June through August for lunch, dinner and happy hour. The contemporary-styled brick-oven pizza tavern. After 10 p.m., the restaurant has a late-night menu and feature DJs. Great sandwiches, fine spirits and fourteen beers on tap. Relaxed, hands-on venue for sushi & seafood boils of shrimp & crawfish, plus ample sides. Full menu including Wisconsin-themed, seasonal and locally sourced; happy hour and late-night destination. Specialty cocktails, local beers and wines. Wine, beer and cocktails. Cigar and pipe smoking allowed in the bar. Creative healthy food prepared by friendly folks. Breakfast, lunch and weekend brunch. Middle Eastern and Mediterranean cuisine. Dine-in or take-out. Farm-to-table restaurant, craft cocktails, liquor store. Dinner, happy hour, late night, weekend brunch. Independent coffee house offering fair trade coffees near the Capitol Square on State Street. 116 Martin Luther King Jr.
Sandwiches made with fresh bread baked onsite, meat and vegetables. Catering available. Dine-in or carry-out. Indian lunch buffet and dinner. Located on the second floor. Casual bar with daily drink specials and outdoor seating. Fresh made burgers, hand cut fries and real ice cream shakes. Serving Korean style BBQ and dishes with a modern twist. Fine asian dining from world class chef Muramoto featuring Japanese cuisine, sushi, whiskey, and sake. Falafel, shawarma, fries, soups, & salads. Hidden, cash-only haunt offering global small plates, cocktails, & beer in an intimate space. Home of good food, made from scratch, plus Greek specialties. Vintage atmosphere. Noodle dishes, soups and salads. Food inspired by the traditions of Wisconsin taverns and supper clubs, made with local ingredients from small Wisconsin producers. Breakfast, lunch, dinner and weekend brunch. Cozy, laid back spot service large portions of seasonal italian fare & an extensive wine list. A neighborhood bar downtown, open 7 days a week, 365 days a year. Extensive beer list; serves food daily until 1:30 am. Homemade gyros and Greek specialties. Rooftop garden dining area. Lunch, dinner and late night. Bar and lounge, 26 beers on tap, outdoor seating. Russian dumplings filled with meat or potato. Lunch, dinner and late night. Located inside Memorial Union, serving fresh roasted coffee and loose leaf tea. Pizza by the slice and other options. Lunch, dinner and late night. Eat-in, take-out or delivery. Bar and grill serving lunch and dinner. Home to the world famous Plazaburger, created in 1964. Sweet and savory staples of fresh pressed juice, salads, Paninis and signature stuffed hand pies; all sourced locally. Poke it up is known for its modern interpretation of classic dishes and its insistence on only using high quality fresh ingredients. Poke restaurant with customizable meats, add ins and sauces. Longtime romantic restaurant serving traditional Italian fare in a venue with a cellar bar & patio. Family dining and contemporary American-style cuisine. Open daily for breakfast, lunch and dinner. Serving subs and toasted subs, salads, soups and flatbreads. Asian styled comfort food specializing in ramen, poke, and noodles. A classic steakhouse and seafood restaurant, featuring over 200 different wines. Lunch and dinner. Sleek eatery serving creative sushi rolls & grilled Japanese fare in modern environs. Country and rock music venue, offering award-winning BBQ, live music weekly and a mechanical bull. Locally-owned and operated. Cash only bar featuring bar games and happy hour drinks. Featuring authentic Laotian and Thai cuisine. Lunch and dinner. Fast-service restaurant and bar. Made-from-scratch sandwiches, soups and salads using locally sourced ingredients. Lunch, dinner, late night, weekend brunch. Inside Madison Children's Museum. Locally-sourced pizza, pasta, salad, kid-friendly options and Chocolate Shoppe ice cream. Offering two-course dining featuring fresh salads and fire-roasted meats. Dinner and Sunday brunch. Offering a wide variety of specialty teas, including bubble tea. A bar where everyone is welcome. Also serving lunch, dinner, happy hour. Classic bar and comfort food, including soups, salads, sandwiches, burgers and flat bread pizza. Lunch, dinner, late night. Entrance on NE side of building. Neighborhood bar since 1933. Pool and shuffleboard tables. LGBTQ-friendly bar and dance club. Coffee and espresso drinks, teas, pastries and merchandise. On the Capitol Square. Coffee and espresso drinks, teas, pastries and merchandise. Near UW campus. Italian street food eatery, featuring hearth-fired pizzas, pasta dishes and piadinas—Italian flatbread sandwiches filled with cheese, meat and vegetables. Try one of our signature selections or create your own dish from our seasonal selections or fresh toppings. Sub sandwiches made to order. Breakfast, lunch and dinner. Near UW campus. Unique European-style cafe serving homemade food, gourmet desserts. Breakfast, lunch, dinner, Sunday brunch. Located upstairs. Snug Japanese eatery featuring a menu that includes sushi, teriyaki, & bento boxes. Taiwan Little Eats, serving traditional night market fare on Madison's State Street. Chinese, Sichuan and Japanese restaurant. Delivery and take out available. Tavernakaya offers a unique yet familiar experience where American tavern meets Japanese izakaya. Located on the Capitol Square. Unique meat, cheese and veggie pasty pies. Sleek, stylish restaurant featuring oysters & other seafood fare plus live music on weekneds. Traditional corner tavern serving Wisconsin bar fare, craft beer and daily specials. Lunch, dinner, drinks. Classic Italian trattoria, three floors of seating, sidewalk cafe, extensive wine list. Lunch and dinner. Voted Best of Madison since 2006. A dining club for members including UW-Madison students, faculty and staff. Meeting, reception and banquet rooms available to members for catered events and private luncheons. Authentic Lao and Thai cuisine. Vegetarian options, large selection of beers and wines. Lunch and dinner. Local pizzeria offering thin crust pizza, deep-dish Chicago style, and double dough. Also available are pasta dishes, sandwiches, appetizers and salads. Boisterous 3-level bar with a party vibe offering DJs, dancing, & a weekly free bacon night. Huge space featuring live bands, DJ's, pool tables, and dance floor. Modern interpretation of classic Japanese dishes specializing in sushi, hibachi, bento, and udon.